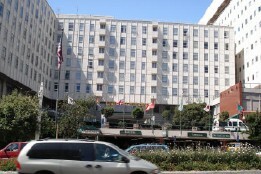 Just a few days after the release of a study finding that California Pacific Medical Center remains highly profitable and capable of a greater share of charity health care in the City than it claims, the San Francisco Board of Supervisors heard an update from City officials on the status of the long-ongoing negotiations between CPMC and the City and County of San Francisco. Before the hearing, which started late due to an overcrowded Board agenda , activists and representatives of community interests expressed trepidation, but also cautious optimism. But some expressed strong criticism of CPMC’s negotiating posture.“This process has not involved the community,” Steve Woo, of the Tenderloin Neighborhood Development Corporation, stated flatly, pointing out that San Franciscans had not heard from the Mayor’s office on the subject since May. “The public is curious to find out what’s going on,” he continued, crediting the Board of Supervisors for creating the opportunity to do so by requesting an update in the hearing. As did many speakers in the evening hearing, Woo emphasized that what’s truly important about the negotiations is how they impact the future. “This is not just a deal,” he said. “This is brokering the future of the City’s health care system.” This concern was reflected in many of the comments in the hearing, hours later, as several of the Supervisors pointed out the long-term implications of the project on nearly every aspect of San Francisco’s municipal life, from transportation to housing to the job market. “What we want,” Woo concluded, “is for the community to have its own place at the table. We believe that Mayor Lee is trying to mediate between the community and Sutter [Health, the parent company of CPMC], but we want to do that ourselves.” Woo noted that his coalition wants to see more in the way of low-income housing development, union rights protections, and local hiring practices in the workforce. Emily Lee, of the Chinese Progressive Association, struck a stronger tone. Lee was present at the press conference for the release of the Hastings study, and echoed many of the concerns raised at that event. “The community is shocked at the disparity between CPMC’s profitability and its derelection of obligations to charity care,” she said. “The community is shocked to see them planning a new luxury hospital, with no indication of how much access low-income patients will have to the facility, while they claim they have no choice but to cut services at St. Luke’s.” Lee reiterated that the proposed sharp reduction in beds at St. Luke’s would force low-income patients of diverse backgrounds to find a new hospital, and that most would choose San Francisco General Hospital due to its proximity. “They’re pushing the burden of charity care onto public hospitals and taxpayers,” said Lee. During extensive presentation of the current facts on the ground regarding the state of negotations, District 9 Supervisor David Campos frequently spoke up. Although numerous City officials made it clear that they were continuing to push the various agenda items ranging from local hiring to health care costs, Campos expressed deep reservations about the process, and about Sutter Health in particular. “The history of how Sutter has interacted with the City and County has not been what we would want it to be,” Campos said, and noted that State officials have only recently intervened in a lawsuit alleging fraudulent hiring practices and several other violations of the law by the conglomerate. Next, it was time for public comment. Calvin Welch, speaking as a representative of a broad-based community coalition seeking to add more community voices to the process, accused the Mayor and City officials of having too narrow a focus with respect to housing issues. Under the current proposal, just 325 housing units would be built, but according to Welch, for CPMC to substantially meet its obligation to offset the housing cost of its development, it would need to build nearly 3000. “Poor people will continue to need housing and health care whether or not this project gets built,” he pointed out. He also noted that whatever CPMC doesn’t fund, taxpayers will be forced to pay for. Another representative of the coalition, speaking on transportation concerns, called attention to CPMC’s promise to offset the thousands of new automobile trips to the Van Ness/Geary area by paying for mass transit for at least 50% of its employees. “CPMC has never achieved a 50% transit share in its history,” she said. She argued that the current proposal would create massive new burdens on transit and parking in the area without providing any mitigation of those impacts. Physicians from St. Luke’s addressed the board as well. George Woo, a veteran doctor whose tenure at St. Luke’s spans decades, lamented the decline in quality of care at the hospital, and wondered how CPMC would maintain a vibrant facility beyond the currently proposed primary care mandate. Another doctor was unable to attend, but spoke through one of his students on behalf of the Physicians Organizing Committee, and pointed out that Sutter has systematically dismantled almost everything but basic medical care at St. Luke’s. He additionally expressed skepticism in Sutter’s ability to rebuild services at St. Luke’s unless mandated to do so by the Board. Perhaps one of the most cutting remarks of the evening was made off-hand, by a nurse from St. Luke’s: “You can close your psych ward but they still come in.” It cut to the core of what’s at stake here: a hospital conglomerate is proposing to cut major services to low-income consumers while enhancing services in more well-to-do neighborhoods, in the name of profit. But the need of working people in the southern areas of San Francisco will not go away. It will just be underserved.